Give a gift to future generations — add a piece of music to the chamber repertoire and help fill the silence left by the lost Terezín artists. ​Your commission will be premiered by a celebrated artist in one of the world's great concert halls. Call us at 857-222-8262 or write us at info@terezinmusic.org to start the conversation. IRIS AND JAY FIALKOFF, sponsors of Sivan Eldar's "The Song About the Child," a choral setting of Salman Masalha’s poem in our Liberation poetry anthology. CYNTHIA AND OLIVER CURME, sponsors of Lubica Cekovska's "Four Movements for Piano." Published by Barenreiter Verlag. Garrick Ohlsson performed the world premiere at the Rudolfinum during the 2013 Prague Spring Festival and the North American premiere at Boston's Symphony Hall. He continues to perform the Commission on tour. 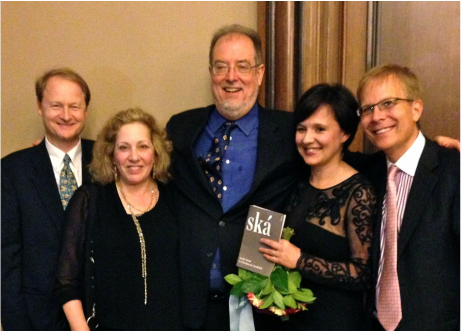 Above: Cynthia and Oliver Curme with pianist Garrick Ohlsson, composer Lubica Cekovska, and Mark Ludwig at the world premiere in Prague. CAROL AND JOE REICH, sponsors of André Previn's 2011 Clarinet Quintet, which they dedicated it to the memory of family members Dr. Townsend B. Friedman and Ambassador Townsend B. Friedman, Jr. The score, published by G. Schirmer, includes their dedication. The world premiere was performed in Boston's Symphony Hall by Boston Symphony Orchestra clarinetist Thomas Martin and the Hawthorne String Quartet. 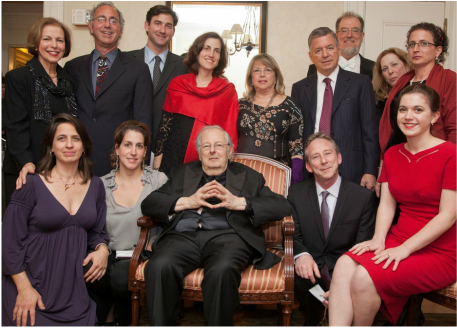 Above: Joe and Carol Reich and family with Andre Previn at the world premiere.